Within 24 hours of the story of the graft dossiers kept by Roberto Baratta's former chauffeur breaking in midweek, 12 people had been arrested. Within 24 hours of the story of the graft dossiers kept by Roberto Baratta’s former chauffeur breaking in midweek, 12 people had been arrested on the orders of Federal Judge Claudio Bonadio and prosecutor Carlos Stornelli, with warrants issued for a further four and 18 people summoned to testify, including Senator Cristina Fernández de Kirchner (next Tuesday). There were a total of 34 raids, including 23 downtown and 11 in Greater Buenos Aires. ◆ Néstor Kirchner (1950-2010), bestknown as president of Argentina from 2003 to 2007 but already suspected of diverting public works funds during his three terms as Santa Cruz Governor between 1991 and 2003. ◆ Cristina Fernández de Kirchner, 65, wife of the former, whom she succeeded as president and was re-elected for a second term ending in 2015. Since last year Senator for Buenos Aires province (first entering the Upper House in 1995, for Santa Cruz). In this investigation she falls more under suspicion as head of the family fortunes than as a specific, operational part of any graft scheme. ◆ Daniel Muñoz, (1957-2016), Néstor Kirchner’s private secretary throughout his presidency, staying on under his wife until 2009. Also worked with the late president in the Santa Fe provincial government from 1995 but going back 15 years previously to the couple’s legal office. Allegedly the presidential couple’s house bagman in the current scandal. 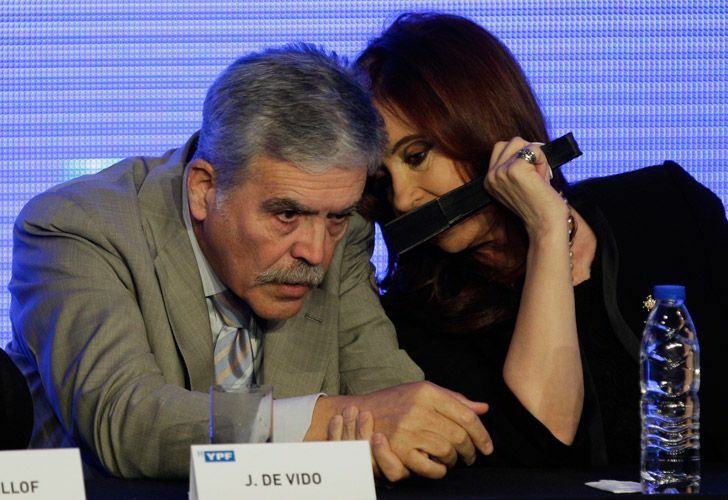 ◆ Julio De Vido, 68, Federal Planning Minister in all three Kirchner terms from 2003 to 2015, the only minister in the Cabinet from start to finish apart, from Labour Minister Carlos Tomada. In charge of all public works, he was the natural head for the allocation and misallocation of funds. Elected deputy for Buenos Aires province in 2015, but expelled from the Lower House and jailed on corruption charges nine months ago. ◆ Roberto Baratta, 45, De Vido’s righthand man with the formal post of planning co-ordination secretary as from 2008 – his co-ordination reportedly extended to the distribution of graft. Arrested last October in the LNG (liquid gas) scandal on the orders of Bonadio but released five months later. ◆ Hernán Gómez, advised the Federal Planning Minisry from 2007 to 2011. Now employed by a cleaning company, he was reportedly a key bagman. ◆ Nelson Lazarte, Baratta’s secretary within the Federal Planning Ministry. Also in the cleaning business but allegedly raked in bribes on the side. ◆ Fabián Ezequiel García Ramón, director of the Renewable Energy Promotion Department within the Federal Planning Ministry from 2008 to 2012 although also said to be keenly interested in renewing the inflow of graft money. An engineer with his own gas company (Andergas), he allegedly specialised in drawing funds out of that sector. ◆ Oscar Centeno, Ministry chauffeur and the man who set this ball rolling after being arrested following his wife Hilda Horovitz’s accusation that he transported money-bags together with Baratta. His meticulous diaries are the basic evidence in this case. ◆ Juan Manuel Abal Medina Jr, 50, CFK’s Cabinet chief from 2011 to 2013 but since estranged from her. Both the Cabinet chief’s offices and car fleet while under his watch are believed to have been used for De Vido’s illicit fund-raising activities. ◆ Hugo Martín Larraburu, Abal Medina’s former secretary while Cabinet Chief who has been arrested on the above suspicions. ◆ José María Olazagasti was De Vido’s private secretary who reportedly participated in all the meetings to co-ordinate the collection of bribes. ◆ Rudy Ulloa Igor, like Centeno started his career as a chauffeur (to Néstor Kirchner) but later became a media magnate in Patagonia. A frequent mention in his fellowdriver Centeno’s diaries. ◆ Juan Carlos Lascurain, president of the Argentine Industrial Union (UIA) from 2008 to 2010. Strongly supportive of Kirchnerism, he has already appeared in court in connection with the Río Turbio coal-mine scandal deeply implicating De Vido. ◆ Norberto Oyarbide, an ex-judge already a byword for corruption ahead of his resignation in 2016. Mentioned in the diaries as frequently in contact with several key figures in the graft scandal. ◆ Oscar Thomas, former executive director at Yacyretá hydro-electric dam. ◆ Carlos José Mundin, BTU SA company. ◆Carlos Wagner, a key figure, not so much because of his Esuco company but as former president of the Argentine Chamber of Construction when he had an absolutely central role in public works. Also mentioned in Odebrecht investigations. ◆ Francisco Valenti, from Industrias Pescarmona engineering multinational..
◆ Walter Fagyas, former president of Enarsa (state oil company created by Néstor Kirchner in 2004 before the renationalisation of YPF in 2012)..
◆ Javier Sánchez Caballero, former managing director of Iecsa, the construction company of the Macri family. The chosen successor of Angelo Calcaterra, President Mauricio Macri’s cousin. Iecsa has already surfaced in Odebrecht probes. ◆ Gerardo Luis Ferreyra, former Maoist guerrilla cellmate of Carlos Zannini, CFK’s Legal and Technical Secretary and 2015 vice-presidential candidate. Now head of Electroingeniería which has teamed up with China’s giant Gezhouba Group to build the Néstor Kirchner and Jorge Cepernic dams in Santa Cruz,. ◆ Jorge Neira, an Electroingeniería executive. ◆ Armando Losón, President of Albanesi building firm. ◆ Claudio Glazman, director of the Sociedad Latinoamericana de Inversiones S.A.